The mild, softly accented voice of Hans Glaser belies a lot of intensity. He’s a businessman who relentlessly pursues success and a race driver who enjoys though competition. He’s a consummate VARA driver …… qualified, quick, safe, serious, but not too serious, and well pleased with the VARA brand of racing. ‘I like the low-key race format of VARA … In Europe there have been problems, as competition becomes fierce and the expensive cars got damaged ….. the European Vintage racer has had to seek low key alternatives … the two types of events still continue over there but more of the fine old cars are just not ‘coming out’." Hans was born in Freiburg, Germany in 1943, the son of an asphalt contractor. The mischievous young Hans would joyride his father'’ huge work truck knowing full well that eventually his escapades would get him in trouble as the often did. His first engineering project, a 1948 Harley Davidson Motorcycle almost ended his career before it got started and it quickly sent him looking for his speed thrills on four wheels. 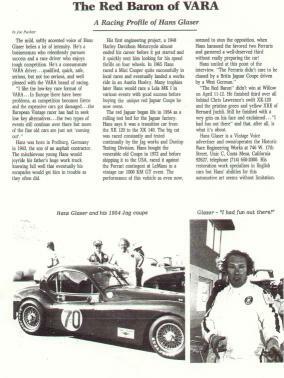 In 1965 Hans raced a Mini Cooper quite successfully in local races and eventually landed a works ride in an Austin Healy. Many trophies later Hans would race a Lola MK I in various events with good success before buying the unique red Jaguar Coupe he now owns. The red Jaguar began life in 1954 as a rolling test bed for the Jaguar factory. Hans says it was a transition car from the XK120 to the XK140. The big cat was raced constantly and tested continually by the Jag works and Dunlop Testing Division. Hans bought the venerable old Coupe in 1972 and before shipping in to the USA, raced it against the Ferrari contingent at LeMans in a vintage car 1000 KM GT event. The performance of the vehicle as even now, seemed to stun the opposition, when Hans harassed the favored two Ferraris and garnered a well-deserved third without really preparing the car ! Hans smiled at this point of the interview. "The Ferraris didn’t care to be chased by a British Jaguar Coupe driven by a West German." "The Red Baron" didn’t win at Willow on April 11-12. He finished third over all behind Chris Lawrence’s swift XK120 and the pristine green and yellow XKE of Bernard Juchli. Still he finished with a wry grin on his face and exclaimed… "I had fun out there" and that, after all, is what it’s about. Hans Glaser is a Vintage Voice advertiser and owns/operates the Historic Race Engineering Works at 746 W. 17th Street, Unit C, Costa Mesa, California 92627, telephone (714)650.2000. His restoration work specializes in English cars but Hans’ abilities for this automotive art seems without limitation.